Good watermelon or bad watermelon? Growing conditions and storage make a huge difference in watermelon flavor and texture, but these tips will help you choose the best available watermelon. 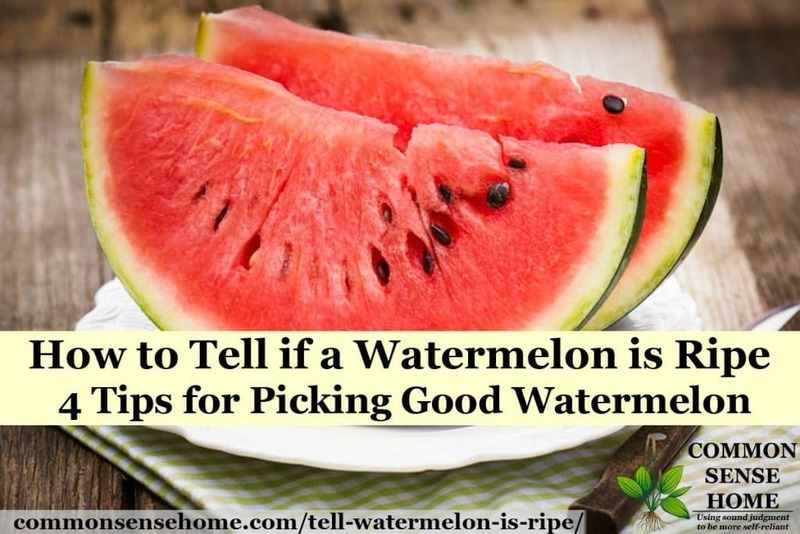 Some of these tips will help you tell when a watermelon is ripe on the vine, others apply to both garden watermelons and watermelons at the grocery store or farmers market. Ripe watermelons are a little trickier to identify than muskmelons. Muskmelons slip right off the vine (i.e. come loose on their own) when ripe. Watermelons don't fall off the vine when ripe. The underside of the watermelon where it touched the ground should be buttery yellow to dark yellow in color. This is called the field patch or field spot. If the field spot as pasty white as a bald guy's head in the middle of a Wisconsin winter, it probably hasn't reach peak ripeness. Different growing conditions and different types of melons will produce a range of colors (inside and out). Warmer weather usually yields a darker field spot. This is a classic way to pick a good watermelon, and the internet is filled with descriptions of how a ripe watermelon should sound. Most say “flat” or “dull”. I think that's a poor description. For my part, “flat and dull” is the sound you get when you rap on something like a giant zucchini – or an underripe watermelon. A ripe watermelon should have a nice, deep hollow sound, more like a drum or knocking on a door. I did a quick video (below). My Powershot D10 doesn't quite do it justice, but you get the general idea. 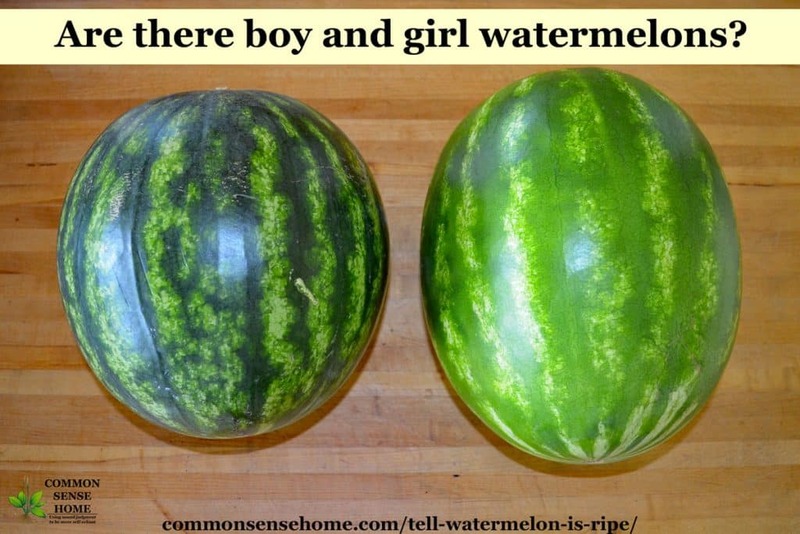 This is for those trying to figure out how to tell if a watermelon is ripe in the garden. If you're watching the patch, you can tell when a particular watermelon is large, well filled out, and hasn't changed significantly in size for some time. 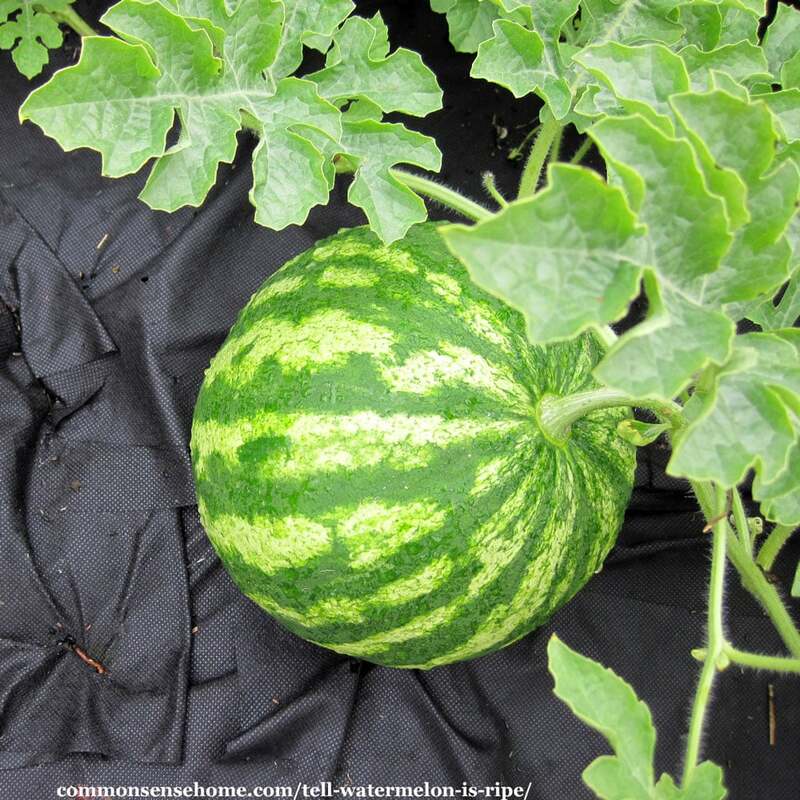 Days to maturity will give you a rough estimate of expected watermelon ripening time. For first time growers, you can check the expected size on the package and weigh them if you want, but the best way to tell is to observe the growth habits of the watermelon. This is another tip for checking ripe watermelons in the garden. Right where the stem to your melon joins the main vine, there should be a little curling tendril of vine. If the tendril is still green and springy, the melon is still growing. If this little tendril is brown and dried, odds are your melon is as ripe as it's going to get. Sometimes all your vines may start dying back before you've harvested, not just a tendril. Ready or not, your watermelons are done growing. Also, if it's been dry, sometimes the tendrils will dry back prematurely, so check the other signs first. Before our melons were ready, I picked one up at the grocery store that I really shouldn't have bought. It was during our brief hot spell this summer, and the melons had obviously been stored too cold because they were chilled and sweating in the bins. Sure enough, I got it home and the flavor was bland and the texture was mushy. Melons like it warm! Storing watermelons at room temperature also makes them more nutritious. 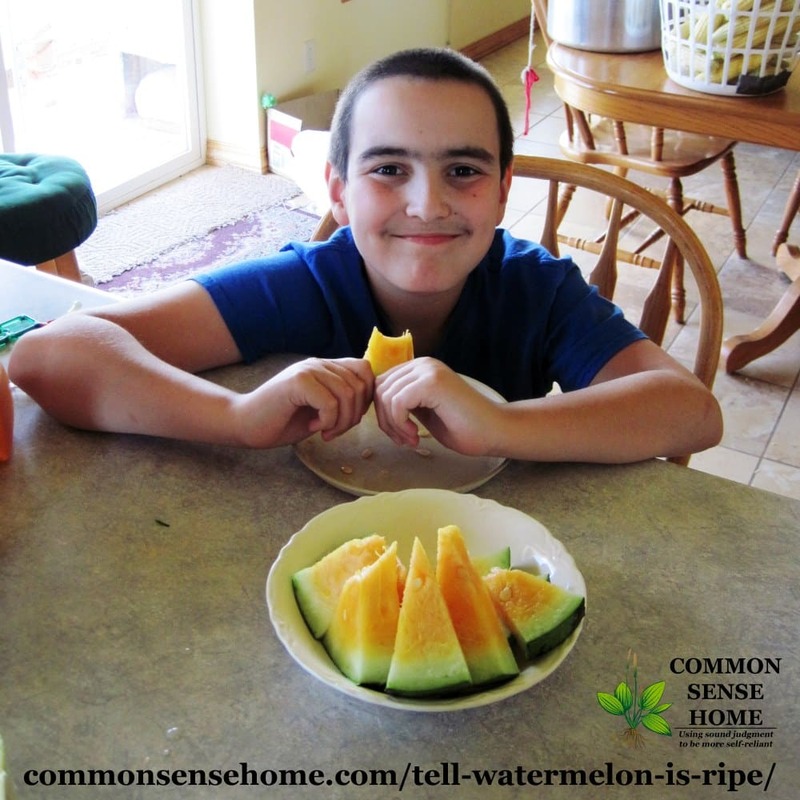 Watermelons stored at room temperature deliver more nutrients than refrigerated or freshly picked melons. Researchers tested several popular varieties of watermelon stored for 14 days at 70 °F, 55 °F and 41 °F. Whole watermelons stored at 70 °F, which is about room temperature in air-conditioned buildings, had substantially more nutrients. 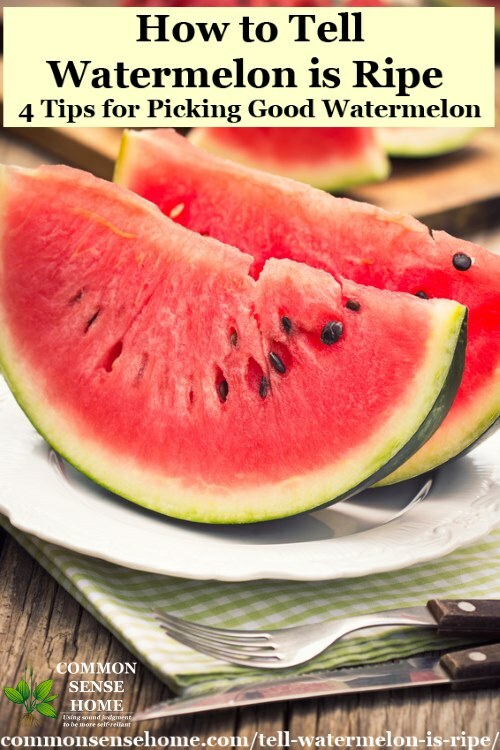 Compared with freshly picked fruit, watermelon stored at 70 °F gained up to 40 percent more lycopene and 50 percent to 139 percent extra beta-carotene, which the body converts to vitamin A. Watermelons continue to produce these nutrients after they are picked and that chilling slows this process. The usual shelf life for watermelons is 14 to 21 days at 13 °C (55 °F) after harvest. 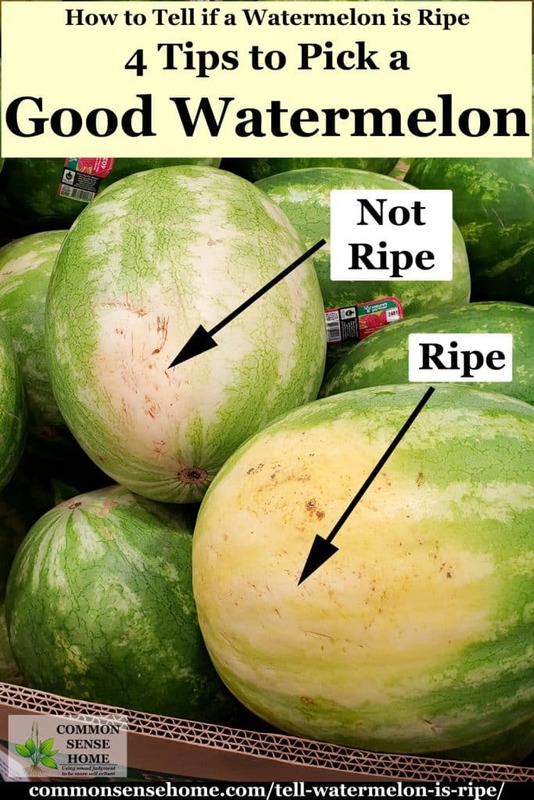 At refrigerated temperatures, such as 41 °F, watermelon starts to decay and develop lesions after a week. So don't store your melon in the fridge until it's cut (or chill only briefly right before serving). Once it's cut and refrigerated, eat it up ASAP. There are numerous web pages, photos and videos circulating on the internet right now (2018) claiming that they are “tips from an experienced farmer” on how to pick a good watermelon. Some of these are valid ways to check if a watermelon is ripe, some of them are flat out wrong. I suspect that the information was made up as a way to sell round watermelons with marks on them. I’ll review these “tips” (listed in italics) to let you know what’s right and what’s wrong. In my experience, heavy exterior scarring often leads to tough or woody areas inside the fruit. (Mild scarring is not a problem.) More scars does not mean a sweeter watermelon. All watermelons come from female flowers, which have a small swelling at the base of the flower. There are no male watermelons. The shape of the watermelon is determined by the variety of watermelon. A round watermelon is not necessarily a good watermelon. For the melons pictured below, both were good, but the so-called “male watermelon” (the longer one) was sweeter then the round one. Check out a bin of watermelons at the grocery store, and you’ll typically find that they are all similar in size. Other than selecting a ripe watermelon in the garden (that has reached full growth), size doesn’t matter. If you start lifting watermelons, I bet in most cases you’ll find that their weights are similar as well. Odds are that a given batch of grocery store melons all came from the same area and ripened under the same conditions, so this isn’t a particularly useful tip. 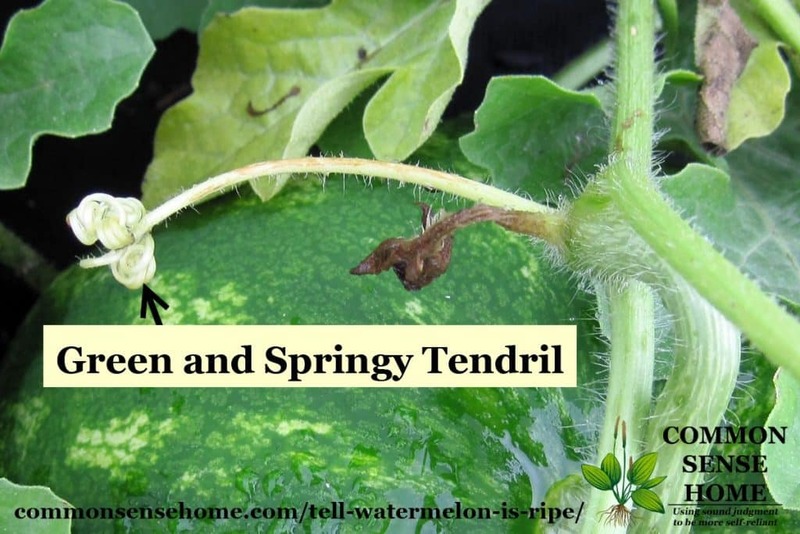 As noted above, it’s the tendril next to the watermelon on the vine that acts as a ripeness indicator. The vine itself may or may not indicate ripeness. 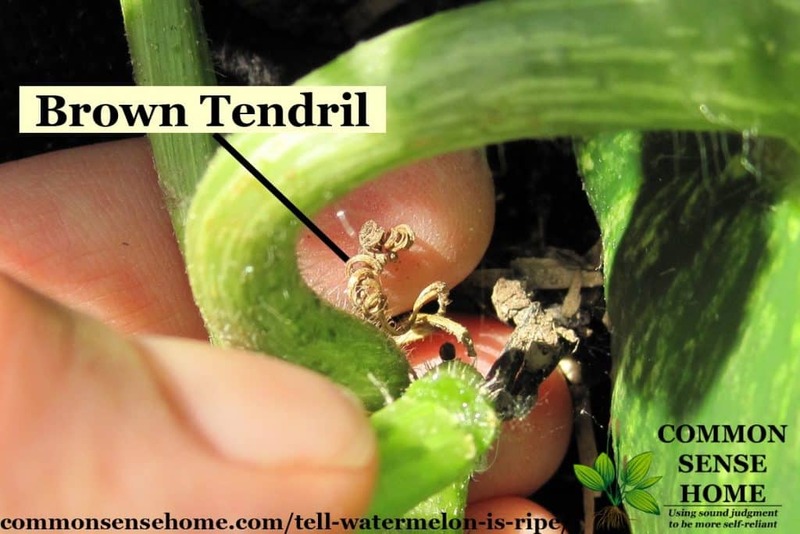 A brown stem could mean that the watermelon was harvested some time ago, and it had time to dry, or it could mean that the plant was dying when the watermelon was harvested. You have no way to know for sure. Even though Orangeglo and Yellow Petite don't get red, the same rules still apply for determining if they are ripe. Here's one of my favorite watermelon photos from a few years ago. Back in my late teens and early 20's, my jobs at the family catering business included picking out the watermelons and carving the watermelon boats for parties. I was known as the resident watermelon expert, almost guaranteed to be able to pick out a good watermelon, if there was a good watermelon to be found. 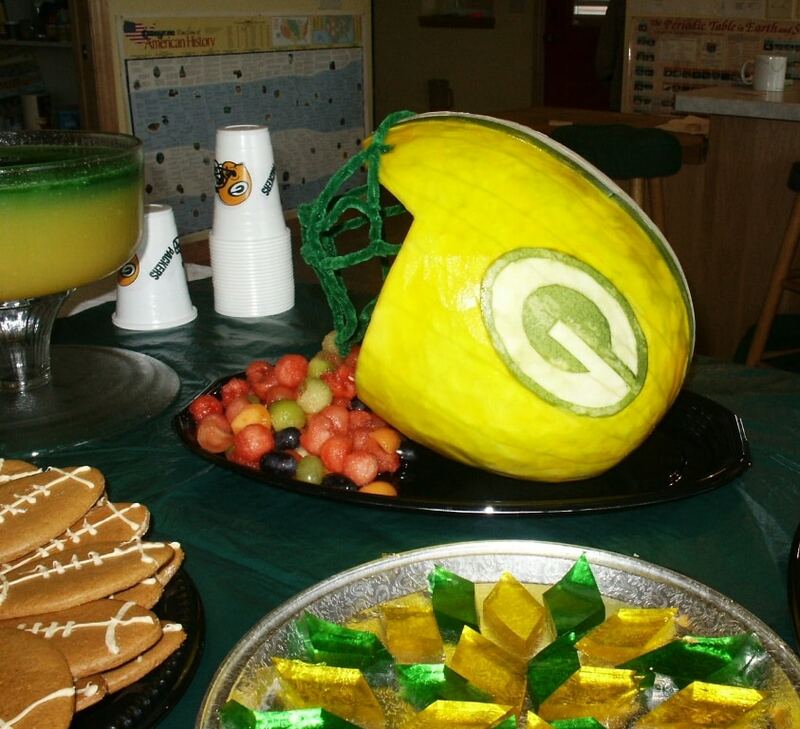 The last time I carved up a watermelon was for a Green Bay Packer party that we hosted for family and friends. Unlike some fruits, watermelons do not ripen further once they are off the vine. Choose carefully, and store watermelons the right way to keep them flavorful. Thanks for reading! We love your shares and comments. Did I miss any tips that you use to pick a good watermelon? Leave a comment and share your thoughts. Originally posted in 2014, updated in 2017, 2018. And even with all these factors, I can still be wrong. It is definitely an art. Some I picked should have been; but weren’t close. Others I thought weren’t ready, were. We had random weather, too. I would have liked our melons sweeter. I did not know about the sitting out part. Interesting. We love our watermelon cold though. Maybe if we let them sit and then chill right before eating? There’s one variety I grew for a couple of years – I think it was called Golden Midget. It turned color (gold) when it got ripe. It was really easy to tell, but the flavor was bland compared to our favorites like Blacktail Mountain, Chelsea and Orangeglo. My Grandson (5yr) & I planted watermelon for the first time, we had one. So Today I googled this topic and all factors were in play but when we cut it open, white, not ripe, I think I was more disappointed than he was. Maybe next year! It’s probably a good idea to note expected days to maturity when planting as well, especially if it’s your first time growing a particular variety, so you at least have a ball park date to shoot for for ripeness. Two years ago I grew some heirloom watermelon called Carolina Cross (these can grow up to 200 lp). Mind you we live in west Centeral Colorado and everyone told me we could not grow watermelons here. I had done a little research and knew it want room to travel so I planted it at the bottom of the garden and really basically ignored it. It got watered when the rest of the row did. The summer was screaming hot for a very long time and we were in a drought situation. One day I actually noticed it and it was getting REALLY big. Late in the fall we finally decided it was finished growing and took our green wagon down to the end of the garden, took pictures of it and cut the vine. Loaded it on to the wagoon and pulled it UP hill. Weighed it up 73 pounds! It was the sweetest best tasting watermelon we had ever eaten. I saved the seeds and we have tried to grow a larger one each year but havent made it yet! That’s great! Up here in Wisconsin, the biggest ones I’ve grown have been just under 20 pounds. We did grow a couple pumpkins that filled up a wheelbarrow, though. I’ve tried hand picking them, but it’s hard to stay ahead of them when the infestation is bad. Some other techniques that sound promising are a hand vac and going after the little devils (especially the nymphs and eggs) with duct tape. I hate squash bugs, have battled them for years trying everything in the book of natural to defeat them. Heirloom squash and picking beetles fair better, but I still lose everything early. This year I broke down and sprinkled 7-dust on the bottom leaves and stems and on the ground where they like to hide, avoiding as much of the flowering time as I could (we have bees). Anyway, one application stopped them for most of the summer, then we had a late issue I didn’t treat and I lost most of the plants. You can try neem oil sprays as well, but I have not had great success against squash bugs with it. Frankly, I would rather use a little dust and have a bountiful harvest than dead plants and rotten food. Look up soil minerals dot Com and get your soil tested, mine was $20. Even well composted manure we were a little low on calcium. After adding that as cheap gypsum, we had the best year ever. Our insect damage was way down. Strengthen your plant with simple nutrients and they repell insects. What worked for me this year was to plant water melons and butternut squash, then pull up the squash and put them in my garbage can as soon as squash bugs appeared. That way, the overwintering squash bugs layed their eggs, and I got rid of them. After that, squash bugs didn’t appear on cantaloupes or water melons. I actually planted the squash about six weeks later, and got no bugs. Don’t know whether this would work every year. What about sprinkling cayenne pepper and cinnamon on your garden? Canning cabbage is not recommended by the USDA because it is a low acid food that may heat unevenly in the jars, leasing to botulism concerns. I usually keep mine in the root cellar for a while, and then freeze or pickle anything that we haven’t eaten when it starts to get soft. Crystal at Homemaking on the Homestead did share instructions for how she pressure cans cabbage for her family. Use at your own risk. Under no circumstances do I recommend water bath canning plain cabbage. Randy I have canned plain cabbage for several years and it is delicious. Most canning books don’t recommend it because they say the flavor gets too strong. I have not found this to be so, but I do always drain out the liquid from the jar and rinse it, then I simply use in a recipe as I would cabbage or fry in a skillet. Sometimes I fry with some sausage, peppers, etc. and sometimes not but we love it. It does have to be pressure canned as it is low acid. Simply cut the cabbage into pieces just small enough to fit into your jar. Pack into your jar leaving 1″ headspace. Add 1/2 tsp. salt to pts and 1 tsp to qts if desired. Pour boiling water over cabbage, leaving 1′ headspace. Remove air bubbles. Process pints for 30 minutes and quarts for 35 minutes at 10 pounds pressure in pressure canner. I learned to do this from my favorite canning book, ‘GROWING AND CANNING YOUR OWN FOOD’, by Jackie Clay. This amazing woman can can anything, you can find her here and I highly recommend her books! : http://www.backwoodshome.com/blogs/JackieClay/ Happy canning and enjoy your cabbage! I was talking to an “old geezer” (that’s what he called himself) about finding a ripe watermelon and he showed me the straw check. He went into the back room, pulled out a piece of dry broom straw and set it on top of the watermelon. If the watermelon is ripe, the straw actually swings around and lines up with the ends of the watermelon. NO KIDDING! I was flabbergasted. It worked…and it’s a good party trick! A quick search shows Crimson Sweet with a Fruit Weight of 25-35 pounds and Days to Maturity = 80 days, so you should be getting close, but the weather can slow ripening down quite a bit. If you didn’t have pink all the way to the rind, give it at least another week or two before you try picking the next one, and check for the signs of ripeness. This post was helpful, as we just picked one (of many) Crimson Sweet and it was not quite pink to the rind and not much flavor. Our tendrils were brown, but the bottoms were not really yellow, so looks like we need to make sure to follow all 4 steps….. Your tips are more comprehensive than any I’ve seen yet!!! Great site! Glad you like the site. I try to write the type of article that I want to read. a few of my sugar babies have brown tendrils but no change of color underneath. what do ya think? There’s really no way for me to tell for sure long distance. Sometimes the tendrils start dying back a little early if it’s been hot and/or dry. Check your days to maturity and planting date, and see if the timing is right, give it a thunk take your best guess. Some varieties don’t develop a field spot. Average days to maturity for watermelons is quite different, depending on the variety, ranging from around 80 days for some of the smaller types to over 100 days for the big southern melons. Cantaloupe should slip off the vine (easily release) when ripe. They will also likely be very fragrant where the vine attaches to the melon. One tip doesn’t work for me due to another trick I learned some time ago. Since watermelons DO have those gripping tendrils all over the vines, and do in fact grow on vines, if given a trellis to grow on your melons never touch the ground and don’t get that yellow spot on one side. They are also less prone to be attacked by ground crawling critters and they are much more uniform in shape. Awesome tips. Am wondering though, if you end up with an unripe melon and it’s been cut is there anyway to help rippen it then? Unfortunately, unlike cantaloupe, watermelons will not ripen further once they are off the vine. I have never had luck growing watermelons. However, this year a vine sprouted up next to my porch. Best guess is the kids spit seeds over the rail. We have harvested 6 melons from this impromptu vine and there is currently 5 more on there!! Nice writeup about watermelons… I have a comment about your short video: Sure, nice sound, but it would help if you could add a one or two UNRIPE melons to COMPARE the sound… yeah, we can describe the sounds in so many ways.. but there is nothing like HEARING IT. That is why I like your video… Just saying there: ” Here is the RIPE SOUND: ##### and here is the UNRIPE SOUND #~~~~~… and here is the RIPE SOUND again ###…” LOL ok?! What I need now is real audio recording equipment to get the full sound comparison. 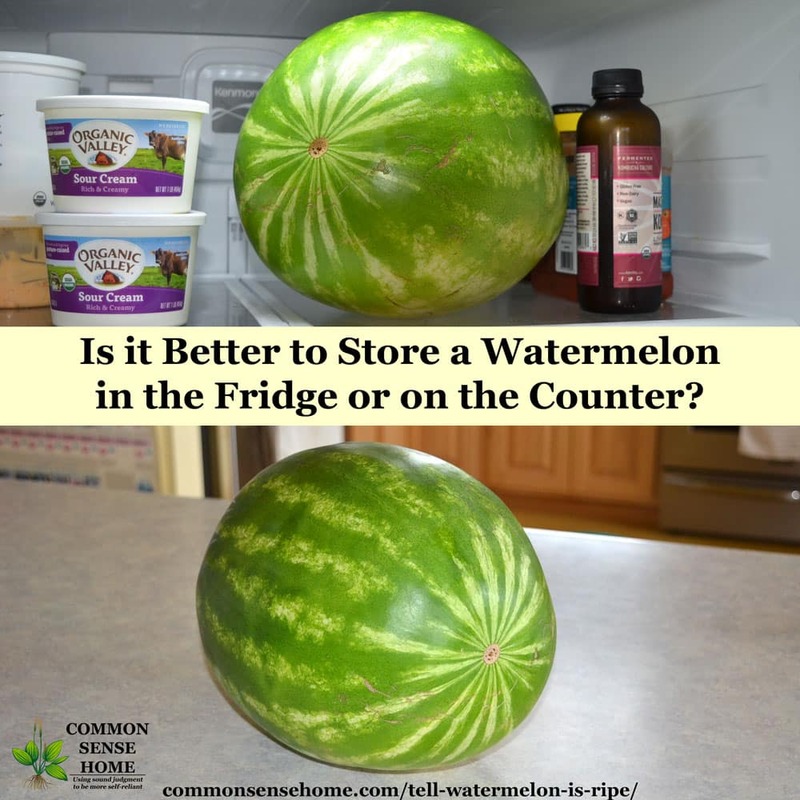 You can also tell if a watermelon is ripe by placing a dry straw perpendicular to the melon and watching how fast it will align with the melon. The more ripe (water) the faster it will move in alignment with the melon. You can find a straw from the broom section of the store. Just pull a dry straw out of the broom and go to the melon section. Put the melon in your basket or on floor so that it sits still without you touching it. Place the straw in the middle of the melon perpendicular to the melon (it will form a plus sign with the melon). Let go of straw and just watch with amazement!!! You will have everyone in the produce section running to the broom dept wanting to try for themselves!!! My grandpa used to pick a watermelon from the garden like this when we were kids! I swear it works!!! My husband asked his melon farming uncle how to tell when one is ripe. After getting a long look that said he surely was from another planet, he said to check for the deepest grooves between the green stripes. Reasoning is that it will sweeten up when it draws from the rind’s moisture, causing ridges & valleys. (Read: don’t water them as their ripening date arrives) Overwatered melons will remain bland for that reason.